Happy 64th wishes from Alan Seaver, Peter Baker and Michael Clemens in the US and Antonio Luce in Italy reminded me that even on this sunny Good Friday morning in Australia, it was still my birthday for a few hours yet on the West Coast of America - 17 hours behind. So, in spite of a jam-packed day yesterday, I still had time for a birthday post. An ideal birthday gift, since no one will set out to buy me an affordable typewriter I might not have. It comes from my son Danny and his friend Emily. Something to rest of my typewriter-weary 64-year-old head on. Appropriate, too, since when I start talking typewriters, my sons hear, "Rhubarb, rhubarb, rhubarb ..."
I don’t appear to be losing much hair; I don’t get Valentines anymore, unless they’re Olivetti portable typewriters, but I do get bottles of wine (thank you Rowan Henderson at the Canberra Museum and Gallery). I’m generally well and truly tucked away in bed by 2.45am, but I sometimes rise at 4am. I can still get in the front door and my sons still occasionally feed me – I feel they still need me (a little). I still can mend fuses, I still wear sweaters (though no longer by the fireside); but, unlike Richard Polt (who’s got another 16 years to go yet) I no longer go for a ride (especially not with a typewriter on the handlebar!). I rarely dig the weeds, I do ask for more (typewriters), it’s a very long time since I was last on the Isle of Wight, and, happily, I don’t have any grandchildren, let alone ones called Vera, Chuck, and Dave. And, sincerely, I don’t think I’m wasting away ... yet. Now, what to do with the rest of my birthday? 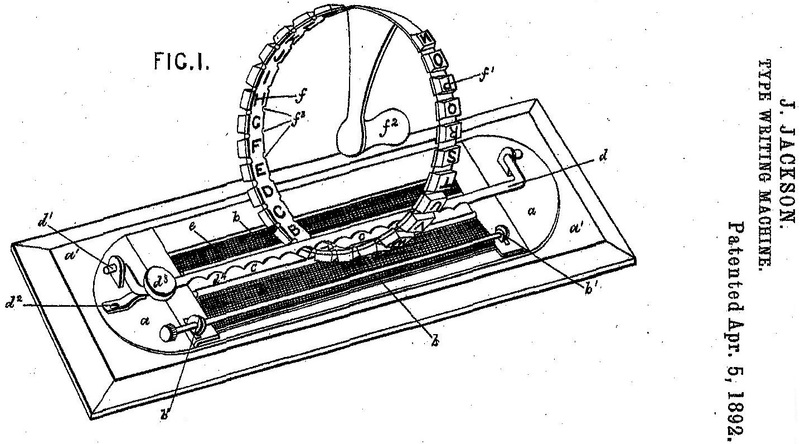 Well, Professor Polt will not be surprised to learn I went looking for typewriter patents dated April 5. Lo and behold, there were a number of typewriter patents issued in the US on April 5, 1892, 120 years ago. I found this one, which I rather fancied, all the more so because the “inventor” was a Londoner called John Jackson, and I’m related to the Jacksons (including some John Jacksons) on my late mother’s Scottish side. Sadly, however, as much as this looks for all the world like the Dollar typewriter, and none other that I’ve ever seen, I’m afraid Robert Hawley Ingersoll got in a few months earlier with that very design. Still, the base on the Jackson design above is the one used on the Dollar. 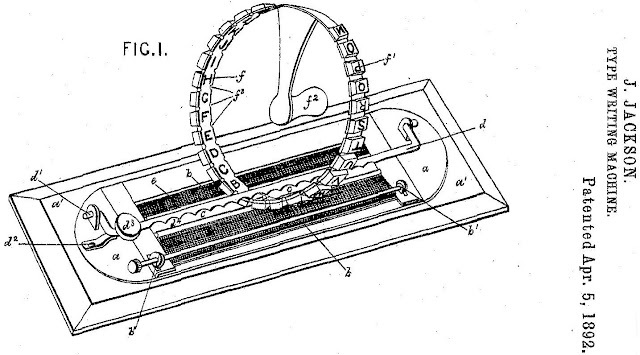 And it's remarkable that two such typewriters were patented almost simultaneously. Remarkable .. or suspicious? 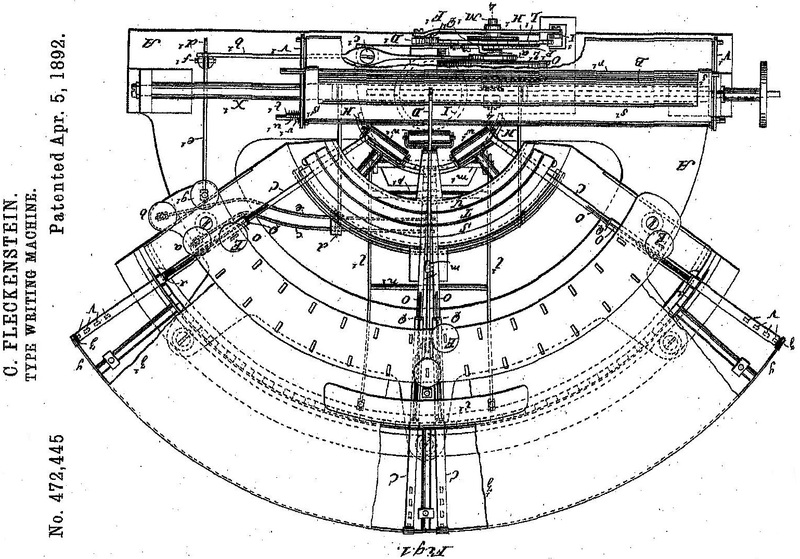 While still in a suspicious mood, I came across what was far more interesting, a patent from Cornelius Fleckenstein assigned to Franz Xaver Wagner – did Wagner’s later visible typewriting invention originate with someone else, I wonder? By pulling out the knob circled in red (above), the platen moves freely of the platen pawl and lever. In many modern typewriters, this mechanism is incorporated in the left platen knob, but is employed in almost exactly the same way. Barron is a hugely important figure in typewriter history, though still a rather mysterious one. Just about all that has previously been written about him is that he was James Densmore’s stepson. 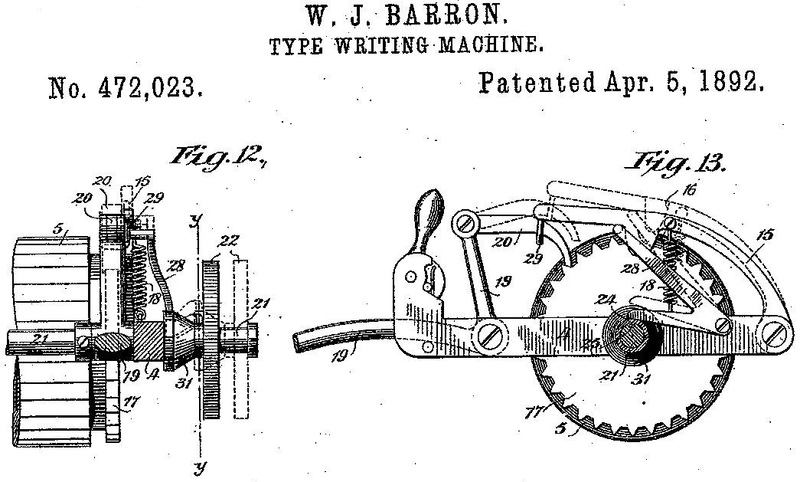 Barron was involved with the Sholes & Glidden project from its early stages, at least by 1871, and continued to develop typewriters during the next 42 years. He may well have designed, with Wagner, George Yost’s Caligraph, not to mention the Yost and the Densmore. Note the line ridges on the platen, designed as an aid in making a clearer type impression on an upstroke typewriter. Perhaps one of the reasons Barron’s background is shrouded in mystery is that, according to some genealogists, he was actually born Walter Jay Barrows, the son of William M. Barrows/Barron and Adelia Ryan, who were married in 1843. It’s possible the family changed its surname, but on the 1860 US census, which lists William as a retired merchant, it would appear the handwriting states “Barron”. Adelia’s first name is often spelt in different ways, usually as Adella and Adela, but as the daughter of Pamelia Jones (and Andrew Ryan) it’s most likely the correct spelling was Adelia. Walter Jay Barron was born on June 27, 1846, in Meadville, Crawford County, Pennsylvania. His father died in 1862. 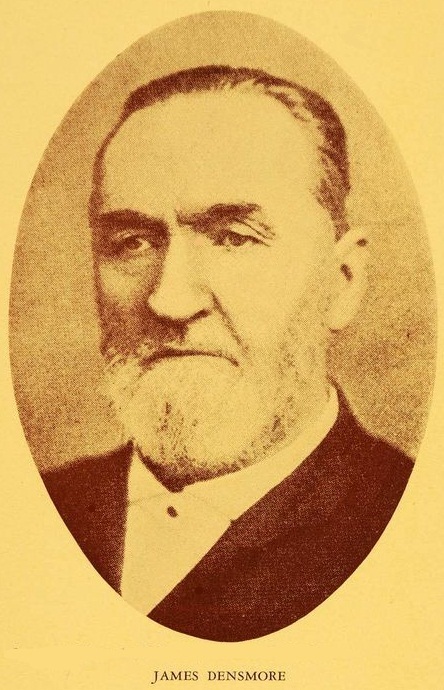 His widowed mother remarried, to Densmore, in 1864. Densmore had settled in Meadville in 1836. He died in Brooklyn on September 16, 1889, and Adelia died in Paris, France, on January 14, 1895. Walter Barron died in Brooklyn on January 1918, and he was buried in the Green-Wood Cemetery, Brooklyn, alongside James and Adelia, on January 18. But it would appear that at the time James Densmore died, he and Walter Barron were estranged. Historian Richard Current, in a reference to patent negotiations with Christopher Latham Sholes, just before Sholes died in Milwaukee on February 17, 1890, described Densmore’s other stepson, Ernest Ryan Barron, as “loyal”. A possible cause was Walter Barron's ongoing work for George Yost, with whom Densmore was clearly in dispute. 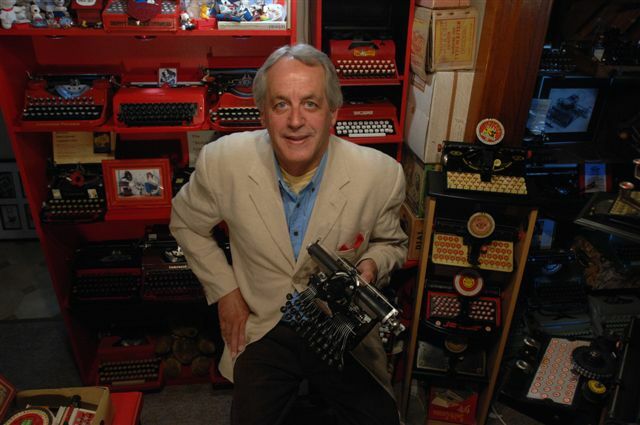 Of Densmore's will, it was written, "His trustees are to continue an arbitration with George W.N.Yost, of Hartford, Connecticut, respecting stocks held by the testator in the Typewriter Company, of New York ... He [Densmore] then disposes of the stock in arbitration, if it should be decided in his favor, making further provisions in that case for the legatees named." When James Densmore died, he left money ($15,000) to Ernest Ryan Barron, but nothing to Walter Jay Barron. Sholes’ last patents, issued in 1896, but which Ernest Ryan Barron had negotiated in January 1890, were assigned according to James Densmore’s will, again excluding Walter Barron. These included the Sholes portable. Firstly - and most importantly, happy birthday, my fellow Australian. 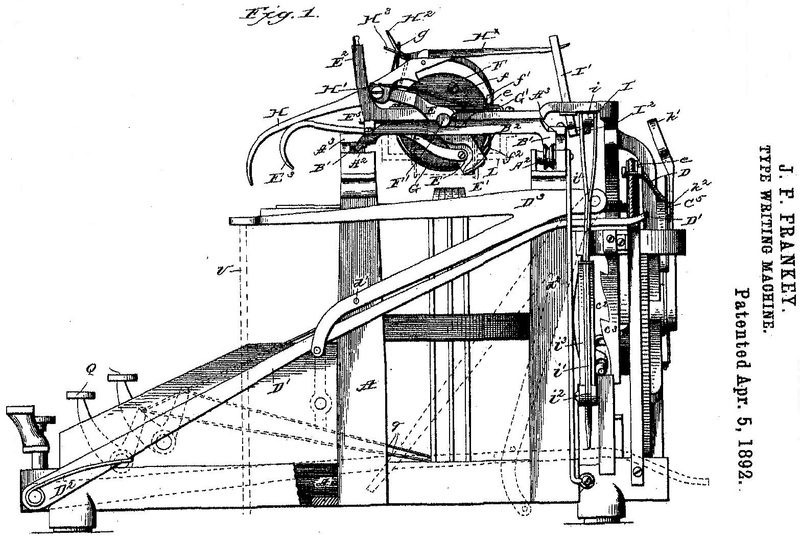 That platen on the Caligraph; that seems quite unusual in it's flat-faced construction. Is this original? I just can't say I've seen a construction like that before. Have you, or anyone else? Took me a few minutes to figure out the action on the upstroke patent, but it seems hugely inefficient, and I suspect there's another patent that relates to the orientation of the type slug on the plateau. But with those long lengths of thin steel, (I think we're seeing it from the widest view) it would have buckled over time. Happy birthday Robert!!! Ad multos!!! I'm a bit late, but HAPPY BIRTHDAY!!!! The date is now forever engrained in my memory banks for 2013. I hope you had a wonderful time. Thank you for another one of your very detailed posts. You do a fine job on them all and I really enjoy reading them. I refer back to many of them frequently. 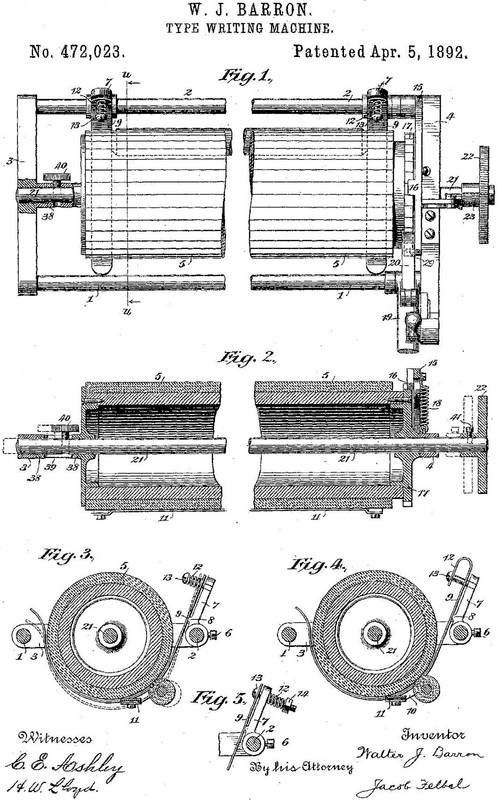 I don't understand any of those patents except the platen release. I'm pretty bad at interpreting technical drawings, I have to say. To Scott: the faceted platen was necessary because they hadn't yet figured out how to put slight curves into the types in order to fit a cylindrical platen. For the same reason, the Sholes & Glidden has small types and a very big cylinder. You had a birthday while I was off-grid for a few days. Belated best wishes!